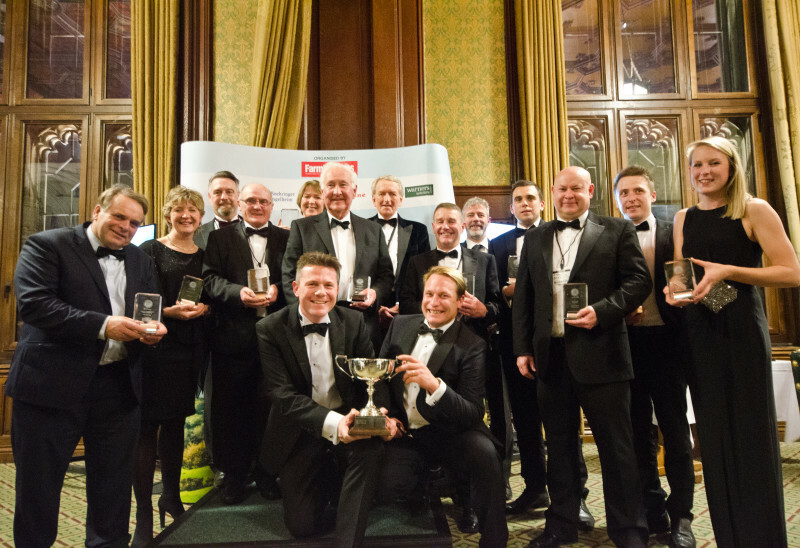 The UK’s thriving farming industry was highlighted on a fantastic night in the House of Commons for the Food & Farming Industry Awards organised by Farm Business magazine. Suffolk-based business RG Abrey Farms won the night’s top accolade and was named Farm Business of the Year. RG Abrey Farms is a third-generation family farming business growing combinable crops, sugar beet and specialising in early new season root vegetable production with modern storage for year-round supply. The business has grown to 3,000 hectares. Giles Abrey, a partner of the business, said: “Our progressive approach is geared towards energy efficient production which is environmentally sympathetic targeting the highest accreditation standards. Elsewhere the other main winners included WM Morrisons as the Retailer of the Year, for its commitment to selling 100% British fresh meat, milk, eggs and many produce lines in season. Edward Hammond won the Progressive Farmer of the Year award for making significant reductions in costs over the last 12 months. The Agronomist of the Year went to Chares Wright of Farmacy, who received credit for helping his customers beyond the call of duty and for his work in looking at the future of agronomy. Neil Parish MP won the award for Outstanding Contribution to Farming for his work as chair of the Environment, Food and Rural Affairs Committee. EFRA last week called on the Government to introduce legislation into the Agriculture Bill to ensure imported food products are held to current British standards as part of any future trade deal. The Food Chain Marketing Award went to Delamere Dairy, which works with nine goat farms across the UK and 20 co-packers across the UK and Europe making products to the company’s specifications. The Food Innovation of the Year award went to Will Macken of Shropshire Salumi, which produces handmade Salumi the traditional way, priding ourselves on the quality of ingredients and its artisan methods. A £2m investment, which included eight storage reservoirs for irrigation and 40km of underground mains, has enabled Andrew Williams of Home Farm Nacton to get more consistent yields each year. It has also invested in buildings to store, cure and refrigerate onions up to 5,400 tonnes. Andrew Francis of Elveden Farms won the Farm Manager of the Year award. He is responsible for 7,700 hectares. As farms director in the business, his role has changed to a more strategic level with four farm managers, a store and technical manager reporting into him. The Young Farmer of the Year award went to Jacob Anthony, a 25 year old, fifth generation beef and sheep hill farmer from the Llynfi Valley a few miles north of Bridgend, South Wales. He works full-time on the 700 acre family farm alongside his father and 86 year old grandfather. The farm consists of 300 head of beef cattle and a flock of 1,000 breeding ewes. The Family Business of the Year went to the Nicholson family from Cannon Hall Farm in South Yorkshire. The business has a completely joined up approach to food production, preparation and service; from field to fork, on one site. In a new category for this year’s Food & Farming Industry Awards, Emily Gascoigne of Synergy Farm Health was named Animal Health Advisor of the Year. She is a farm animal veterinary surgeon with a specialist interest in sheep health and production.